Roberto "Robbie" Alomar Velázquez (/ˈæləmɑːr/; Spanish pronunciation: [aloˈmaɾ]; born February 5, 1968) is a former Major League Baseball player (1988–2004), regarded highly as a second baseman. During his career, the 12-time All-Star won more Gold Gloves (10) than any other second baseman in baseball history, and also won the third-most Silver Slugger Awards (4) for a second baseman. On January 5, 2011, Alomar was elected to the Baseball Hall of Fame, in his second year of eligibility. He became the first Hall of Fame member to be inducted as a Toronto Blue Jays player. Currently, Alomar serves as a Special Advisor to the Blue Jays. Alomar was a switch-hitter and threw right-handed. He is the son of Sandy Alomar Sr., a former All-Star second baseman with a 15-year MLB career. His older brother, Sandy Alomar Jr., was a Major League All-Star catcher and is now the first base coach for the Cleveland Indians. 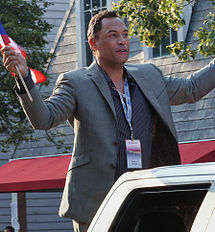 Alomar was born in Ponce, Puerto Rico and raised in Salinas, Puerto Rico. The son of Santos "Sandy" Alomar Sr. and María Velázquez, Alomar grew up in a baseball family. He and his older brother Sandy Jr. were raised mostly by their mother, due to their father's Major League career. When school in Puerto Rico was out for the summer, they joined their father, who let his sons hang around the clubhouse, shag fly balls, and absorb the game—especially from his New York Yankees teammates, such as Thurman Munson and Graig Nettles. Growing up, Alomar idolized both his father and José Cruz. In 1985, Alomar signed with the San Diego Padres at age 17, and joined the team's Class-A affiliate, the Charleston Rainbows. The following year, playing for the Reno Padres, he won the California League batting title with a .346 average. Alomar was suspended for the first five regular season games in 1997 and donated $50,000 to ALD research. Alomar and Hirschbeck settled their differences publicly and made apologies to each other on April 22, 1997, standing at home plate and shaking hands in front of the crowd before an Orioles game. In a 17-year career, Alomar was a .300/.371/.443 hitter, with 210 home runs and 1,134 RBI in 2,379 games. At the time of his retirement, he was 51st all-time with 2,724 career hits. Defensively, Alomar posted a .984 fielding percentage at second base. He led the American League in fielding percentage four times (1992, 1995, 1999, and 2001). Alomar married Puerto Rican model Maripily Rivera on June 1, 2009. The next year, Rivera alleged that she had been victim of aggression from Alomar and that she wanted to end the marriage. Alomar alleged that Rivera had threatened to divorce him unless he gave her half ownership of his Tampa residence. The divorce was finalized on July 12, 2011 with a private settlement. On December 12, 2012, Alomar married Toronto native Kim Perks at the Art Gallery of Ontario. Their first daughter was born in 2014. Alomar resides in Toronto. ^ a b Porter, David L. (2004). Latino and African American athletes today: a biographical dictionary. Greenwood Publishing Group. p. 20. ISBN 978-0-313-32048-4. Retrieved April 13, 2010. ^ "12-time All-Star retires; has back, vision problems". ESPN. ESPN Internet Ventures. Associated Press. March 19, 2005. Archived from the original on May 23, 2009. Retrieved May 23, 2009. ^ Namee, Matthew (June 28, 2004). "Roberto Alomar: A Forgotten Legend?". The Hardball Times. Archived from the original on May 23, 2009. Retrieved May 23, 2009. ^ "Silver Slugger Award Winners – National League". Baseball-Reference.com. Archived from the original on May 23, 2009. Retrieved May 23, 2009. ^ Kepner, Tyler (January 5, 2011). "Roberto Alomar and Bert Blyleven Elected to Hall of Fame". The New York Times. ^ a b c d e Britton, John A (2002) . Dawson, Dawn P (ed.). Great Athletes. 1 (Revised ed.). Salem Press. pp. 49–51. ISBN 1-58765-008-8. ^ Van Hyning, Thomas E.; Eduardo Valero (2004). Puerto Rico's Winter League: A History of Major League Baseball's Launching Pad. McFarland. p. 111. ISBN 978-0-7864-1970-8. Retrieved April 13, 2010. ^ "Roberto Alomar Biography". www.bookrags.com. ^ a b Lubinger, Bill (July 19, 2011). "Roberto Alomar's long route to Cooperstown glory ran through Cleveland". Cleveland.com. Retrieved August 5, 2013. ^ Kepner, Tyler (January 4, 2010). "Roberto Alomar Awaits the Hall's Call". The New York Times. Retrieved August 5, 2013. ^ Wolpin, Stewart; Robinson, James G. "Roberto Alomar". BaseballLibrary.com. Idea Logical Company. Archived from the original on May 23, 2009. Retrieved May 23, 2009. ^ a b "Roberto Alomar from the Chronology". BaseballLibrary.com. Idea Logical Company. Archived from the original on May 23, 2009. Retrieved May 23, 2009. ^ a b Gillick, Alomar fittingly enter Hall together MLB.com. Accessed on February 24, 2012. ^ "Blue Jays to retire Alomar's No. 12". The Toronto Star. Archived from the original on April 26, 2016. Retrieved July 20, 2011. ^ Wulf, Steve (June 24, 2001). "The Spit Hits The Fan". Time Magazine. Retrieved July 9, 2009. ^ Rosenthal, Ken (January 7, 2010). "Snub of Alomar exposes flaw in voting". Fox Sports. Retrieved August 24, 2018. ^ "Eight votes shy, Alomar 'disappointed'". Major League Baseball. ^ "News - 2010 BBWAA Election Results". community.baseballhall.org. ^ nurun.com. "Alomar, Quantrill inducted in Hall of Fame". The London Free Press. ^ Ribas, Fernando (January 26, 2011). "Dedican Serie del Caribe a Roberto Alomar". El Nuevo Dia (in Spanish). El Nuevo Dia. Retrieved January 26, 2011. ^ Fish, Mike (December 1, 2012). "Drama follows retired baseball All-Star". ESPN. ^ Vargas, Patricia (July 12, 2011). "Maripily divorciada y millonaria". El Nuevo Día. ^ Gómez, María Gabriela (July 12, 2011). "Maripily ya esta divorciada". Primera Hora. ^ Elliott, Bob (December 12, 2012). "Hall of Famer Roberto Alomar marries in Toronto on 12-12-12". Toronto Sun. ^ "Se convierte en padre Roberto Alomar". El Nuevo Día. April 11, 2014. Retrieved April 12, 2014. ^ Roberto Alomar impressed by Jose Reyes SLAM! Sports. Accessed on June 20, 2013. ^ Torres, Adry (July 24, 2011). "Roberto Alomar Enters Hall of Fame".